This month's Go Wireless column features the Grace Digital Solo Wi-Fi Internet Radio Receiver is a combination Internet radio receiver and audio media streaming device that brings all the audio content of the Internet to your stereo system. With it users can listen to 18,000+ radio stations from NPR, FOX news, CNN, BBC, CBS to KROQ, and over 35,000 podcast as well as On-Demand subscription streams or your personal Pandora radio stations seamlessly from their home setup. 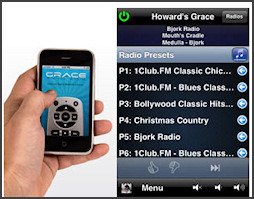 Additional features include the ability to stream files from local computer networks, compatibility with the free Grace remote control App for iPhone/iTouch and alarm clock functionality. Convenient Access to Online Music in Your Home AM and FM radio stations all over the world stream their audio content over the Internet. 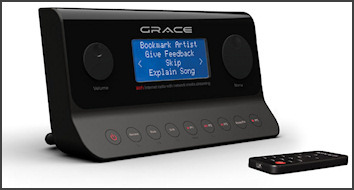 Grace Digital Audio's "Solo" product line of Wi-Fi Receiver and Media Streamers allow you link this massive amount of free content, as well as a variety of pay Internet radio services, conveniently and efficiently to your stereo or home entertainment system. Setup is simple, all you need is access to a broadband Internet connection and a wireless router. Acting like any wireless device, once configured to the Wi-Fi signal(s) available and its security, if any, the Solo Wi-Fi Receiver provides quick access to literally thousand of Internet radio stations and podcasts from your home stereo without having to fire up a computer. 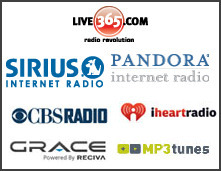 In addition, users can listen to the hottest premium online music services like Pandora, Live365 and Sirius. Although designed as an Internet radio component for your stereo system, the Solo also allows users to do other things with their sound. For example, it can also be used as a clock radio/alarmtaking advantage of its built-in clock with backlit LCD display, five individual alarms and sleep timeror acting further as a bridge between your computer network and your stereo, it can stream your digital music collection directly from your PC or Mac to your home stereo. Supported formats include: audio - AIFF, AIFC, WAVE, CAF, NeXT, ADTS, MP3, AAC, Ogg Vorbis, FLAC, WMA; playlist - ASX, M3U, PLS; streaming protocols - HTTP, HTTPS, RTSP, WSMP, Shoutcast. Users can also utilize either the full function remote control included, with its 10 presets, search and song skip functionality, or control via iPhone / iPod Touch. Enjoy a world of music in your living room, bedroom, home office, kitchenanywhere in your home. Add more Squeezebox Wi-Fi music players and listen to a different song in any room in your home, or synchronize them all together to hear the same music everywhere. You can also use the Squeezebox Controller to control the entire family of Squeezebox players throughout your home. The auto-dimming display adjusts for any lighting condition and is readable from across a room. The aqua-blue display features an integrated light sensor that complements ambient lightingso its never too bright, or too dim. Overview/Review: The workmanship, design and easy of use earns the Grace Wi-Fi Internet Radio a 5 Star review from Celtic Radio. This system is a real genius of innovation. An impressive compilation of technology, internet and music to give you many hours of enjoyment. Best of all this system works with Live365.com, so you will be able to listen to all of the Celtic Radio channels! Now Go Wireless!